Our 240 page Fall 2018 issue of Mystery Tribune is a must-have featuring short fiction by the acclaimed author Reed Farrel Coleman and Scandinavian author Ragnar Jónasson. A curated collection of photography from European and North American artists, and an interview with award winning Max Allan Collins on noir comics novel “The Night I Died” are among the other highlights. Want a discount? Become a member by purchasing Mystery Tribune Digital Subscription! Stories by Reed Farrel Coleman, Ragnar Jónasson, Charles Salzberg, Justin Bendell, Michael Anthony, Alison Preston, Lance Mason, Joe De Quattro, Bern Sy Moss, Michael Smith, and Richard Risemberg. Interviews and Reviews by Max Allan Collins, Cara Hunter, Charles Perry and Nick Kolakowski. 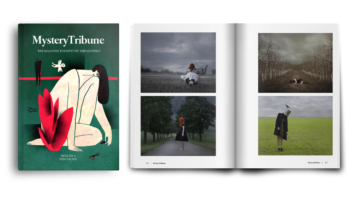 Art and Photography by Patty Maher, Nathan Colantonio, Linda Kristiansen, Philip Kanwischer, and Milica Staletovic. This issue also features a preview of the new Mike Hammer graphic novel by Max Allan Collins and based on the work of Mickey Spillane. An elegantly crafted quarterly issue, with a beautiful layout designed for optimal reading experience, our Fall 2018 issue will make a perfect companion or gift for avid mystery readers and fans of literary crime fiction. This digital edition will be delivered to readers in EPUB format.